Awesome interview with the admirable David Firth. 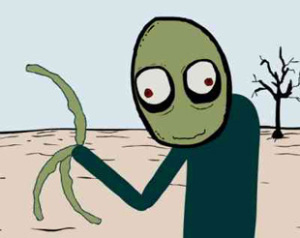 “I never set out to “stand out” from anything, but rather just create what I thought was missing.” So says David Firth, creator of the cult classic internet cartoon Salad Fingers (don’t follow this link if it’s past nine in the evening, if you’re by yourself, or if you know anyone with a North English accent). After releasing the ultimate in oddness almost ten years ago, David worked on a number of equally strange projects; from telling the tales of Drillbithead (a cute little fellow with a drill bit in place of most of his face) for the BBC to writing and animating Sock, a series based on his own dreams.